Max Dickeson, a Bachelor of Arts student majoring in English (honours), has received the $2,500 HMA Architects Award in Critical Studies, given for outstanding academic achievement and leadership in the Faculty of Creative and Critical Studies. "I was surprised to be chosen for the award, but very pleased," says Dickeson. "I hope it means that I am doing very good, relevant work in the area of critical studies." Dickeson, who is in his last year of studies, is writing his honours essay under the supervision of English professor Margaret Reeves. Dickenson's essay explores melancholy in modern fantasy novels, investigating and interpreting the novels as adult texts. "The criteria for the HMA Architects Award include academic excellence and leadership in the community," says Reeves. "Max excels in both these areas. 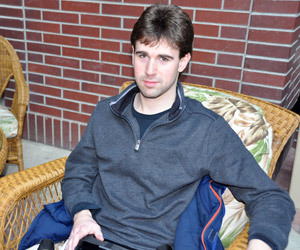 His academic performance to date made him an obvious candidate for this award, and his work in UBC Okanagan's writing centre, where he helps other undergraduates by providing advice and feedback on their writing, is an example of his willingness to share his learning and expertise with his peers. "Max is an accomplished, hard-working, yet remarkably modest individual. His insightful critical perspective on the literary works that he studies is enhanced by his wonderful sense of humour." Dickeson is a native of the Okanagan and went to Summerland High School before beginning his post-secondary education at UBC Okanagan. He anticipates pursuing a master's degree, but plans to explore his options after graduation.